An epic project in both size and purview, Peter Sloterdijk’s three-volume, 2,500-page Spheres is the late-twentieth-century bookend to Heidegger’s Being and Time. Rejecting the century’s predominant philosophical focus on temporality, Sloterdijk, a self-described „student of the air,“ reinterprets the history of Western metaphysics as an inherently spatial and immunological project, from the discovery of self (bubble) to the exploration of world (globe) to the poetics of plurality (foam). Exploring macro- and micro-space from the Greek agora to the contemporary urban apartment, Sloterdijk is able to synthesize, with immense erudition, the spatial theories of Aristotle, René Descartes, Gaston Bachelard, Walter Benjamin, and Georges Bataille into a morphology of shared, or multipolar, dwelling–identifying the question of being as one bound up with the aerial technology of architectonics and anthropogenesis.Sloterdijk describes Bubbles, the first volume of Spheres, as a general theory of the structures that allow couplings–or as the book’s original intended subtitle put it, an „archeology of the intimate.“ Bubbles includes a wide array of images, not to illustrate Sloterdijk’s discourse, but to offer a spatial and visual „parallel narrative“ to his exploration of bubbles.Written over the course of a decade, the Spheres trilogy has waited another decade for its much-anticipated English translation from Semiotext(e). 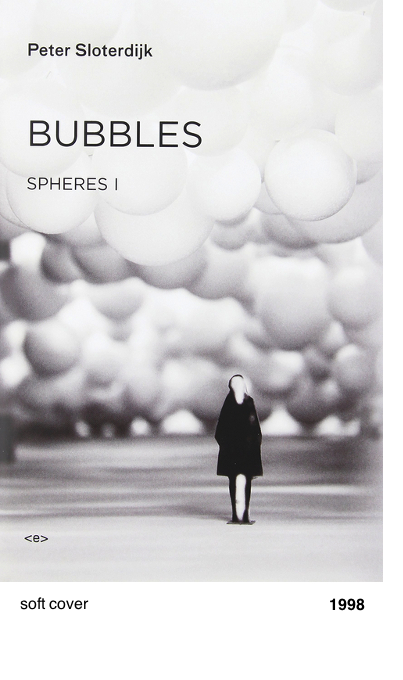 Volumes II, Globes, and III, Foam, will be published in the coming seasons.